Discussion in 'Engine, Drivetrain, and Exhaust Discussion' started by Terry@BMS, Dec 20, 2018. Better late than never... 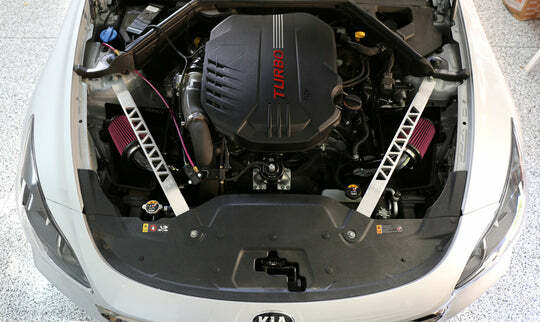 Finally released our BMS Stinger Intakes! In stock and ready to ship. Intro price $329. So it leaves the bottom half of the stock air box? And are the pipes plastic or painted/powder aluminum? Yes, this retains the factory bottom. The factory airbox bottom does a wonderful job of both isolating heat and ducting airflow from the front. The factory intake restriction is in the upper half of the airbox. The pipes are aluminum and powder coated glossy black. Yes we're using K&N oiled filters for them. 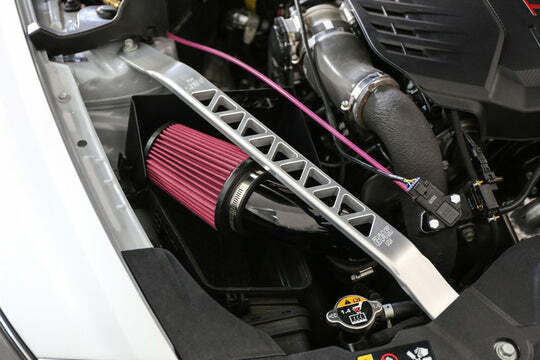 For cars with JB4s, Intercoolers, Downpipes etc do you think larger filter elements (K&N Typhoon vs. these) will make a difference? Nice design... reminds me of a nicer Tork intake... especially with the shielding. Great pricing also. We've tested these filters up to 460whp of course, no vacuum in the tube. I think they will be fine up to around 600whp. I just hate oiled filters... a lot. Keeping the bottom portion of the OEM intake makes it "cold air" intake as a lot of air is directed to filter from front of the car. When car is moving a lot of colder air is coming through the OEM scoops. “A LOT” is misleading, the stock scoops are partially blocked by the front.... now adding Velosa scoops would be much better. Oiled work well for this platform because there is no MAF sensor to worry about contaminating. No issues with oiled filters... Outside of cleaning after dust storms. Generally they perform the same. I'm just not a big believer in the "scoops" business, having tested them several times myself on previous applications. Maybe the Stinger will be different but I've never seen 60-130mph gains materialize. I think the reason the factory airbox inlets tend to perform better than they look like they should is because we all under estimate the amount of pressure in front of the radiator/grills while at higher speed pushing air through those factory openings. Had two questions ... first being I made a DIY intake and used the hard plastic elbow to connect to the filter. Do you see this as being an issue at all with it being plastic? Second question, could you please please offer just the shields for sale? For they folks living in dusty areas will you offer a non-oiled version? If there is enough demand we can offer a dry filter option. We only offer them as full kits as that is how we made the batch. In terms of DIY option as long as it's the same or larger diameter than the stock pipe you removed should be fine. I wonder if there are any options or anyone making any shields that could be purchased..